Why is Shravan Month Auspicious? Shravan Mahina (July – August) is one of the holiest months in a traditional Hindu calendar. The month is dedicated to Lord Shiva and millions of Shiva devotees visit various shrines and offer water, milk and belpatra (Bilva leaves). Mondays in Shrawan month is considered highly auspicious to offer prayers to Lord Shiva. Legend has it that during the famous Samudra Manthan episode (Churning of Ocean) mentioned in the Puranas, 14 types of precious things came out as a result of the churning of the ocean. Asuras (Demons) and Devas (Demi Gods) shared thirteen of them. The last precious thing that appeared was the called ‘halahal’. It had the power to destroy the universe. To save the universe, Lord Shiva consumed the ‘halahal’ and stored it in his throat. When Lord Shiva started consuming the poison, all the Gods and holy saints appeared on the sky and started offering the holy Ganga water to Lord Shiva to make lessen the effect of the poison Halahala. This auspicious event is believed to have taken place in the Shravan Month. From that day onwards people started bathing the Shivling with water and it became a tradition. Why is The month Auspicious? It is believed that prayers offered in the month will be answered quickly. 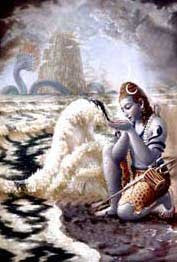 Shiva blesses devotees with wealth, peace and prosperity. Offering Pujas and undertaking fasting helps in removing obstacles in life. It is also believed that people get relief from various diseases after observing the vrat and pujas in the month.